I love food, anyone who's been around the blog long enough knows just how true this is. But when I was asked about how mindfully I eat, I was stumped. Mindful eating is all about being present and conscious of not only your food choices but they hows and the whys of eating. What am I eating? Why am I eating it? How am I eating it? Yes, I’m shovelling it in my cake hole but what else am I doing at the same time? 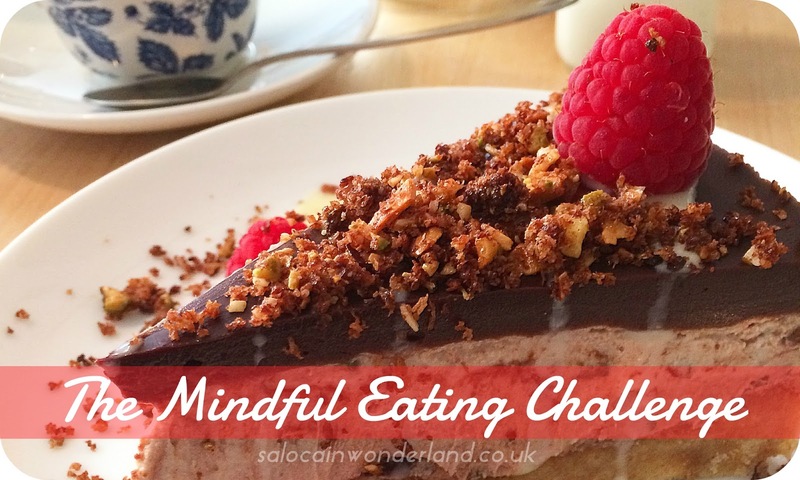 When I first heard of mindful eating, I thought it was some new diet fad, think about your food, long and hard before you put it in your mouth - well by then it will have gone cold because the hamster on the wheel will have passed out from hunger - no thank you! Turns out, it's not about that at all. Mindful eating is not so much about thinking of the food, but being aware. The whole point of mindful eating is less about getting as much food down your gullet until you pop and more about listening to what your body wants. What are you really hungry for? So, armed with some helpful tips and tricks for mindful eating for better living, I decided to eat mindfully for 24 hours. Here’s how it went. What I usually do - Kettle on, the latest episode of Arrow downloaded on the Sky+ box, some cereal in a bowl, splash of soy milk, pour myself a smoothie, make my cup of tea and get comfy on the sofa. What I did mindfully - Kettle on, tv off. I looked through every cupboard and weighed up all the possible breakfast options. What I really wanted was scrambled eggs, mushrooms and a slice of whole grain toast - so I made it. I took my time, sipping my brew as I went. When everything was cooked I sat at the table instead of on the couch and I ate with no distractions. No phone, no book, no tv, nothing. Just me and my eggs. What I usually do - Kettle on in the break room, lunch box out the fridge. I then read my book whilst I eat my lunch and scroll through Twitter, Instagram and Facebook whilst I drink my tea. In between all of this I will usually sit and have a chat with my colleagues too, all the while putting every crumb from my lunch box into my mouth. What I did mindfully - I took a later lunch, knowing the break room would be much quieter. Kettle on (some habits just don’t die! ), lunch box out the freezer. My lunch for work is pretty healthy; sale wrap, soy yoghurt with seeds, nuts and raisins, a bag of grapes and some chocolate. With no-one to talk to, my phone in my bag and my book closed, I ate my lunch. Surprisingly I was starting to feel really full after my wrap and yoghurt so I saved the grapes and chocolate for later. After eating, I drank my tea slowly, with no distractions. What I usually do - Scrounge around the freezer, my trusty Ministry of Food in hand, seeing what I can pull together to eat. I’m a meal planner so I usually have a rough idea of what I’m having for my tea most nights, but this can feel restrictive and with very few options for change. Whatever I pull together, the Mr and I usually sit down in front of the tv - currently working our way through Flash! What I did mindfully - With the challenge in mind I bought a couple more random bits in the weekly shop and only loosely meal planned - there was enough in the cupboards to make meals outside of the planned ones, just in case we fancied something different. Funny how when you don’t have a plan you can let you just let your stomach guide you. Once we had some stomach approved food we both sat down at the table, popped on a little music and enjoyed our meal and each others company, minus The Flash. I couldn’t believe how full I felt through most of my meals. I’m a clean the plate kinda girl but when I was only focusing on the food, the taste, texture, smells, the memories certain meals evoked, I was full long before my plate was cleared - which meant more awesome food for leftovers. I also found that when I really thought about what I wanted to eat, I picked out healthier options. Example - I wanted a snack, so instead of reaching for a packet of crisp to munch my way through, I went and made myself some avocado on toast - nothing complicated but because I had to put some effort into it, I took my time, and damn was that some good avocado on toast - which kept me full right up until dinner time! There were times when I thought I was hungry, peckish, needing something to nibble on - so I drank a glass of water instead and told myself if I was still feeling the munchies twenty minutes later, I would go on the hunt. Turned out I was only looking to snack out of boredom. Once I distracted myself with something fun to do (FYI my Enchanted Garden colouring book!) those ‘hungry’ feels disappeared. After just 24 hours of eating mindfully I’m keen to embrace it for the long term. Listening to what my body wants and fuelling it with the energy it's asking for not only means I’m eating healthier, but I have the peace of mind knowing that I’m getting exactly what I need and enjoying it in the process. Have you ever tried eating mindfully, even just for one day? What did your body really want? This post was written on behalf of Legal and General who set me the mindful eating challenge. All thoughts, opinions and ramblings are 100% my own. For more information, see my disclaimer policy here. If you feel so much better eating like this, I think you should continue like this. I have been trying to do it more and more, especially at breakfast time. I find it really sets you up for the day! It's more difficult during lunch though, especially when I'm in work! This really does sound like they way you SHOULD eat, but I'm not sure I have time to eat without multitasking! Haha it's hard to put down the phone or the book or turn off the tv, I feel as though I will never managed to watch/read/schedule anything if I'm not doing it at the same time as doing something else. It's hard to focus on one single task when so much else needs doing at the same time! I know! I guess when we're really taking our time eating and thinking about every mouthful we appreciate it so much more and we're also giving ourselves a chance to digest the food so no wonder we feel fuller sooner!